Steel scales over canvas backing. 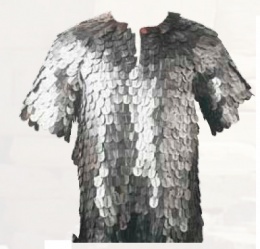 Known as lorica squamata to the Romans, scale armor, like this hauberk of Greek Scale Armor, consists of several small metal scales that have been attached to a simple backing material with the intent of creating an effective suit of armor. This method provided many of the benefits of full plate armor, while allowing for greater mobility due to its increased flexibility. In addition, this full shirt provided good coverage with no gaps between adjoining plates. The individual scales were also much simpler to replace, meaning a damaged suit would be much simpler and faster to repair than plate armor. based on parts of armor found in Somerset and now at display in Taunton's Somerset county Museum. This page was last modified on 7 June 2014, at 19:45.